I have a list which contains several taxes for each class of taxes. which means the searching has to involve 5 lines. How can I make notepad++ to find this special text and replace it? Can I attach a screenshot to my question? 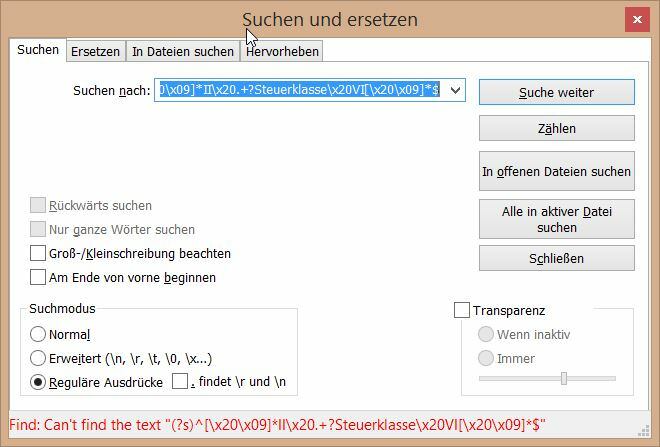 It’s important to note that the (?s)^II\x20.+Steuerklasse\x20VI\R syntax, would grasp all text, between the first regex II\x20 of the file and the last regex Steuerklasse\x20VI of the file !! Of course, you may replace any syntax \x20 with a single space character ! Is there another setting, I have to set? The \R at the end might be the issue if your last line (Steuerklasse VI) doesn’t have a carriage return set. I think perhaps, that the bold marked parts makes the differences between working and not working. But how can I change the bold marked settings? And how can I insert a screenshot in this reply? I’d like you to see my inserts and settings for comparing. used html renderer (markdown) knows a syntax to embed external images. to embed it into the post. I don’t think the bolded lines have any effect on it but who knows. The file is empty, only its existence is needed to switch from off to on. %APPDATA% but rather use the ones in the install directory. The export plugin gives the additional features to copy the text in rtf and/or html format. Did you try Peters suggestion as well? but I got the same errormessage again. In my answer to Claudia I put the debuginfo perhaps it will help, but I don’t know where I can make the alterations for the bold marked information (admin mode and local conf mode). At this point it is probably best to do what @Claudia-Frank suggested and post some real data. I describe how to reasonably do that (post some data) in this thread. Try to avoid a straight paste of data into a posting as you did in the first post in this thread, as often data contains special markdown commands. Another possibility is to use a site like www.textuploader.com and then post the link in a reply here. Of course, as Claudia said if your data is “sensitive” you may want to replace any sensitive info with different (but format-equivalent) dummy data first. I tested it with Peter’s suggestion as well and I got the same errormessage. Befor I can import it to an xls(x) file, there is a want for a slight trimming for a better import, because there are too many irregularities for import. The text link will be available for one week from today. Image just posted is of dubious value; @PeterJones already posted it as well as solved your original problem…or is there something new to keep this going? 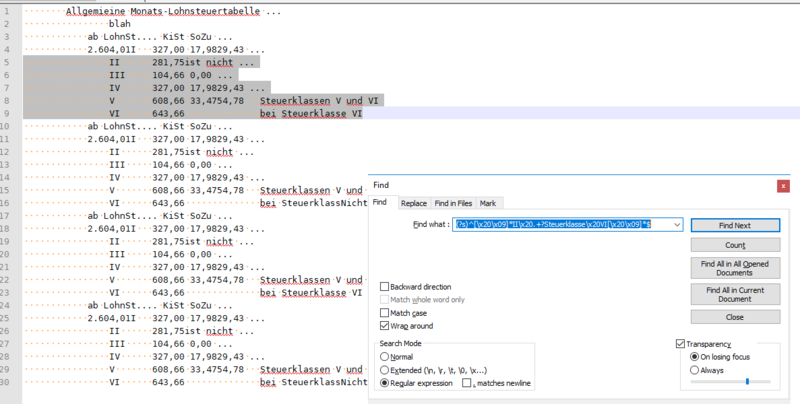 It seems, as if Notepad++ think the searching syntax is part of a text, not an order. 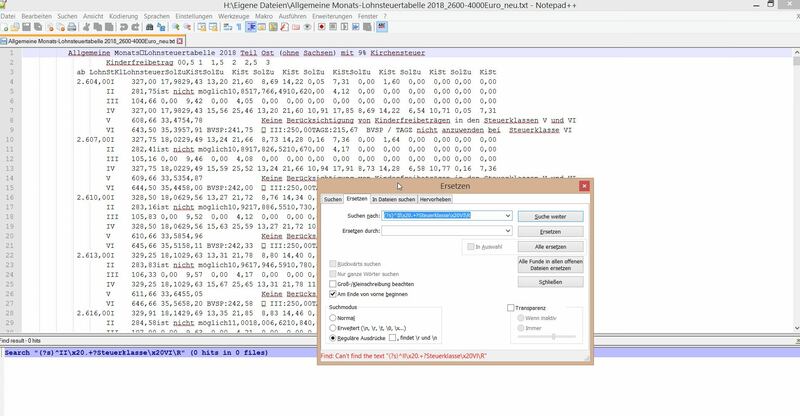 With that option set, when you begin your search, for instance, at the middle of your file, The regex engine first searches occurrences from that location to the very end of your file. Then, it go back to the very beginning of the file and continue searching until the initial location of your cursor, before the search/replace operation ! Is there a setting in the programm itself, which is restraining the search-routine to recognize the syntax as a syntax and not as a part of a normal text? when I use the same options you have suggested and insert the syntax into the field “search what” by copy and paste. I compare the syntax, which you have written down with the one I have put it copy and by paste into the field every time before I push the button “Find next”. I don’t dare to push the button “replace” because I don’t want to purge the file. The screenshot you showed is back to using the old regex, which didn’t allow for spaces before the II, and required a newline at the end (so won’t match the very last occurrence) – we already showed that was wrong for your data, and explained why. Please try it again with one of the new ones, like (?s)^[\x20\x09]*II\x20.+?Steuerklasse\x20VI[\x20\x09]*$. I know you haven’t asked for it, but I assume if you ever make my regex match, you’ll soon be noticing something I saw. However, if you modify the regex to (?s)^[\x20\x09]*II\x20(?:.(? !^[\x20\x09]*II\x20))+?Steuerklasse\x20VI[\x20\x09]*$, it will match just the third “paragraph”, as seen in the lower-right, which I am assuming what you’ll eventually want. Moving inside, the dot . still matches one character. By using ^[\x20\x09]*II\x20 (which was what we used to define the start-of-match, earlier) as the ___ in the negative lookahead, we are saying “we don’t want our standard start-of-match sequence to be anywhere inside our match”. 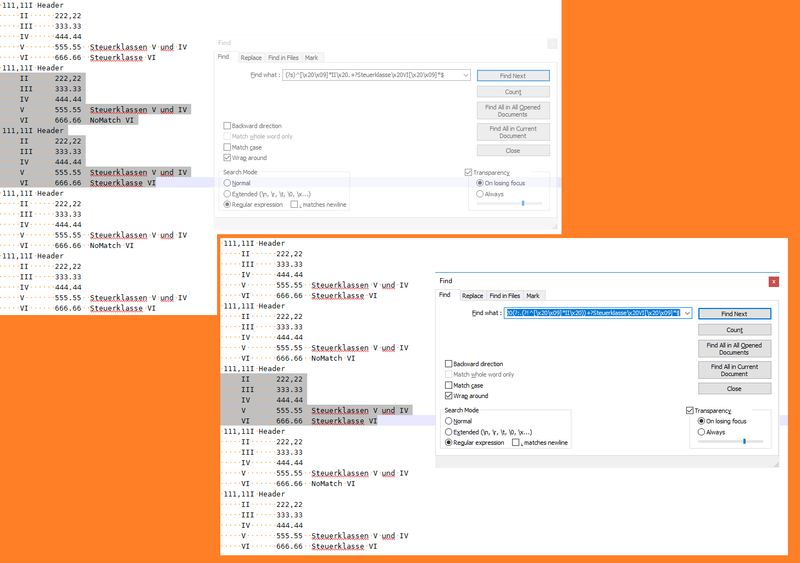 And the regex B catches the entire FIVE lines, beginning with Roman number II ( with possible horizontal blank characters before ) and ending with the string Steuerklasse VI, ONLY IF the string Header cannot be found, at any position, of the smallest multi-lines sequence of characters, after the regex \h*II\x20 till the regex Steuerklasse\x20VI ! I also, used the alternative (\R|\z), just in case the very last line would be a line VI 666.66 Steuerklasse VI, without any line-break !